A competition starts with the “elimination pool” system. The fencers are divided into groups (pools) of between five and seven fencers; all of the competitors in a pool fence each other. Each pairing is called a bout. The bout begins with the referee saying: “On guard, ready? 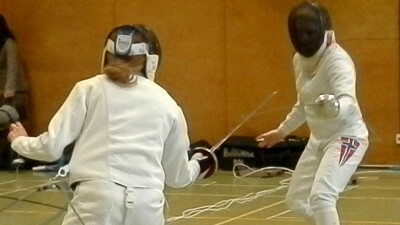 Fence!” A bout lasts for three minutes of actual fencing time or until one fencer scores five hits. Based on the results from the pools, the top percentage – typically 80% depending on the size of the entry – advance into a direct elimination ladder, similar to the knock-out stages of football or tennis tournaments. How the fencers are placed in the draw (seeding) is based on the pool results. In the elimination format, bouts are longer since the losing fencer will be eliminated. The elimination bout is usually run to 10 hits. The top four then advance into the semi-finals, then the top pair go into the final with a play-off for third place. Bouts in these stages last for three, three-minute periods, or until one fencer scores 15 hits.